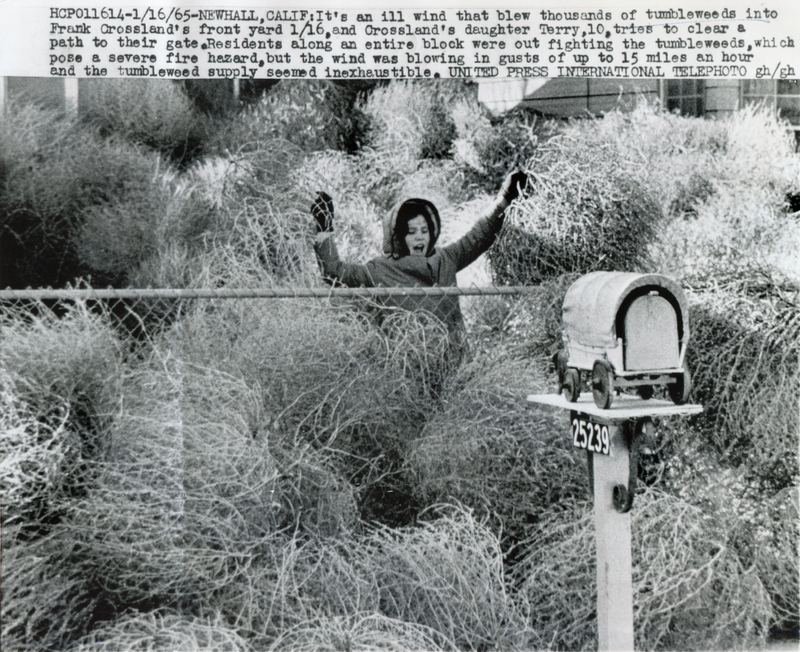 Newhall resident Terry Crossland, 10, wades through the tumbleweeds that have blown into her front yard, January 16, 1965. 8x10 glossy United Press International Photo (folded), from the archive of the Cleveland Press newspaper (1878-1982). HCP011614 — 1/16/65 — NEWHALL, CALIF: It's an ill wind that blew thousands of tumbleweeds into Frank Crossland's front yard 1/16, and Crossland's daughter Terry, 10, tries to clear a path to their gate. Residents along an entire block were out fighting the tumbleweeds, which pose a severe fire hazard, but the wind was blowing in gusts of up to 15 miles an hour and the tumbleweed supply seemed inexhaustible. UNITED PRESS INTERNATIONAL TELEPHOTO. LW2693: 19200 dpi jpeg from original photograph purchased 2014 by Leon Worden.